Good evening everyone! I hope you are all having a great hump day! 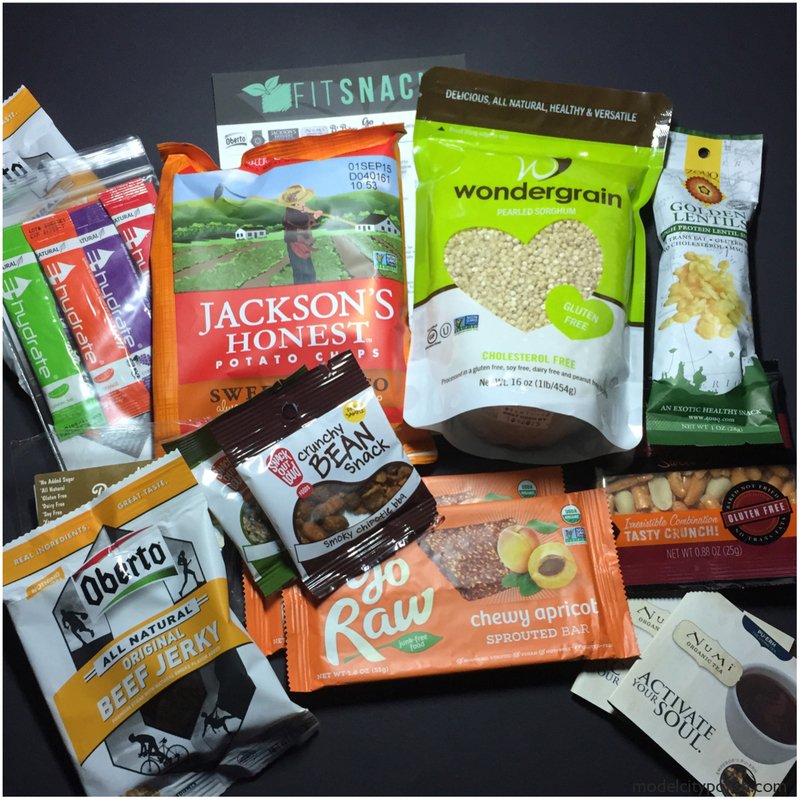 Today I have my latest Fit Snack Box contents to share with you guys. This month’s box blew me away, there was SO much stuff!!!! Numi Tea Bags – Numi Organic Tea blends premium organic teas and herbs with only 100% real ingredients, allowing nature to speak for itself. The Emperor’s Pu-erh tea provides sustained energy and delivers focus and clarity. Oberto Beef Jerky – Oberto All Natural Beef Jerky is a great source of protein for your active lifestyle. You get out what you put in it! Zouq Foods Golden Lentils- A potpurri of sweet and sour tastes, harmoniously blended with rice flakes, chick pea flour, peanuts, and turmeric. E-hydrate Drink Mix – E-hydrate is a natural powdered drink mix that can be added to any liquid to deliver vitamins, minerals, and more electrolytes than the leading sport drinks. E-hydrate is healthy hydration. Wondergrain Sorghum – Wondergrain, is a delicious and versatile power grain. Gluten-free, cholesterol-free, and high in protein, fiber, and iron. The softest bite & fastest cooking sorghum you’ll find! Go Raw Chewy Granola Bar – Snacking made easy with Go Raw Junk-Free Food. We make it easy to GO RAW. When you snack, Go Raw. B’Bites Dried Fruit and Nuts – B’Bites is a delicious dried fruit and nut snack that is raw, all-natural, gluten-free, dairy-free, soy-free, and vegan. Jackson’s Honest Chips – Organic, Non-GMO, and Heirloom potatoes are cooked low and slow in organic coconut oil far a crispy, satiating crunch. Goodness. Pass it on. Snack Out Loud Bean Snack – Crunchy Bean Snacks are free from gluten, soy, nuts, and GMOs, and packed with protein, fiber and iron. Snack on! Wow! That is a lot of stuff! The Oberto Beef Jerky, Crunchy Bean Snacks, Numi Tea Bags, and Go Raw Chewy Granola Bar I got two packs each! Another awesome feature in this month’s box was a recipe for the Wondergrain Sorghum, I can’t wait to make this and share with you guys. All in all this Fit Snack Box was the best so far. Tons of great goods and all perfect for someone on the go, like me. Fit Snack is a convenient monthly subscription service that brings healthy choices to your door. You can choose to pay month to month or buy three month, six month, or one year subscription. Also right now if you follow the Model City exclusive link, you get a free gym bag with your first box. Be sure to give Fit Snack a follow on Facebook, Twitter, or Instagram for more photos and healthy tips. Also if you want to see more of my box as I try out the various goodies, follow me on Instagram. Thank you so much for stopping by today and I will see you all again tomorrow. These products were sent to me for free but that does not influence my opinion.